Item # 306746 Stash Points: 995 (?) This is the number of points you get in The Zumiez Stash for purchasing this item. Stash points are redeemable for exclusive rewards only available to Zumiez Stash members. To redeem your points check out the rewards catalog on thestash.zumiez.com. Class up your looks with the To The Moon Ring 4 Pack from Stone + Locket. This four pack of rings includes one color changing mood ring, 2 stamped silver rings with details inspired by the moon, and one star gem ring. Wear them all at once, or switch them up for a look that is sure to lift your mood. 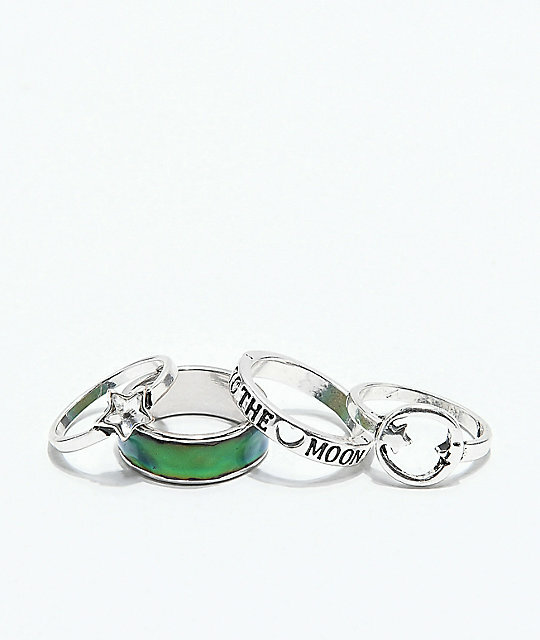 To The Moon Ring 4 Pack from Stone + Locket. 2 stamped silver moon bands. 1 color changing mood ring.